Ed. Note: If you disagree with the OPs about the safety of skating on the canal please do so in a civil and respectful manner. Thank you. On Sunday morning, two friends and I went skating on the canal, dropping in from the parking lot just next to Chain Bridge. We were heading down toward Georgetown and throwing a puck around, but by about 12:30 the ice in some places was beginning to look at bit wet so we turned around. Just as we went under the Chain Bridge in the middle of the channel heading north, the ice gave way and the three of us fell in. Fortunately some very kind people passing by on the trail managed to fish us out. We are all fine — albeit a little scratched and bruised — now that we have dried off and warmed up. The only casualties seem to be two hockey sticks, three hockey gloves, a tube of Chapstick and three iPhones (though each of those is now snuggled in its own bag of rice — fingers crossed). However, in the excitement and the cold, we never had a real opportunity to thank those people who helped us. So to the two men who pulled us out, and probably got very wet and cold in the process, a huge thank you. The same to everyone else who stopped and offered warm clothing — we really appreciate all the kindness that people showed to us today. Even after all of this, we would all skate on the canal again. Don’t take this incident as a reason not to. It’s is a beautiful way to spend cold winter morning. But be careful of the ice underneath the bridge, which apparently gets soft easily because of the runoff from the roadway above. Stick to the river side of the canal where at least if the ice does break, it’s only knee deep. And if anyone happens to pick up two hockey sticks and three hockey gloves from the canal, please let us know. We admittedly wouldn’t mind getting them back! There are signs at Widewater, where the water is so deep it never freezes enough to be safe. Our role is to advise visitors of unsafe conditions when we become aware of them. Do so nicely. Elsewhere, the canal is usually safe because it is so shallow. People may get wet feet and be cold, but this is rarely a life-threatening emergency. If you are not sure, telephone dispatch and talk to them about it. 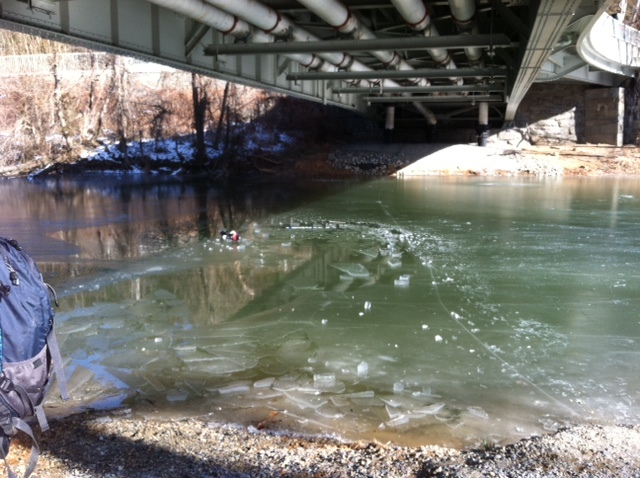 If person goes through the ice at Widewater or other deep water area, call 911. No heroics; without the right gear, you will just be another casualty. If an animal goes through the ice, no humans should be put at risk to save it, but you could call dispatch and ask what they recommend.